Hi friends, back again for a quick post. We are headed for a different adventure, one that doesn’t involve the Winnebago for now. 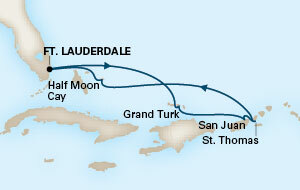 We will be in the Eastern Caribbean aboard Holland America’s Westerdam, visiting Grand Turk, San Juan, St. Thomas, Half Moon Cay … just a delightful trip of sun and sea. We booked a snorkel excursion to St. John and Trunk Bay Beach, so look for some pictures from the adventure once we return. The Winnebago is repaired, winterized and ready for the next great adventure (not sure where yet). I just posted a video of our trek up and down the Angel’s Landing Trail at Zion National Park to YouTube (see the link from the Places and Videos page). Again, it is just some simple video of me holding the camera as I walked behind or ahead of Jackie as we made our way up, up, up the trail of switchbacks. At the top “base camp” area and just before the last half mile or so of trail we probably should have left the backpacks and hiking poles, since the final portion was more a “hands and feet” type of hike up and across the rocky ridge. But we did try to climb along the chain-assisted ridge for a stretch, until it just became too busy with hikers trying to pass around us. We turned back, and as you will see, it still was a challenge. If you slipped on those smooth rocks, there wasn’t anything to grab on the way down the slope to the bottom (except maybe another hiker), so we were ok with the cautious approach. Did it, bought the t-shirt! Enjoy!